OK, so now that I’ve posted my New Year’s Resolutions I guess it’s time to begin following up on them, right?? My second resolution [loose 10 lbs/exercise/eat healthy] is something I can get started on, but first, I need a plan! Having Arthritis makes it difficult to do exercise of any kind and these commercials of people hiking and riding bikes don’t help either. It’s true that movement helps ease the fatigue and stiffness, but the ugly truth is that some exercises also makes my pain and inflammation worst! Not to mention, leaves me unable to sleep a wink and out of commission for the rest of the week. Just ONE afternoon of walking at the mall leaves me with red, painful and swollen knees that I later have to treat with ice packs throughout the night. If you think about it, it makes sense. Inflammation in the joints cause deformation and exasperating it can actually increase this damaging inflammation. Any doctor or physical therapist will tell you that joint pain is NEVER good, which is why it’s super important to listen to your body whenever you do physical activity of any kind, whether you have Arthritis or not! However, on the flip side, it is important that I move around because unfortunately the stiffness can also worsten my already decreased range of motion and cause muscle atrophy (aka: more problems I DON’T need). So, not only is it a challenge for me to get up and get going, but it’s also very difficult to find exercises that I can actually do! So what is a girl to do in this situation?! Luckily, there is a great resource online called, My RA Fit Kit where you can customize a fitness program based on your personal limitations and interests! I’ve filled it out and here is the program I’m going to get started on today! I’m not sure if this Arthritis-approved workout is going to help me loose 10 lbs….but either way I think it will help. 😉 I’ll keep you all posted on how it goes. I think by the second or third week of January we all have our New Year’s resolutions set. However, before I tell you what mine are, I’d like to take the time to reflect on this past year. In 2013, I spent 2 weeks (including Christmas Day and New Years Day) in the hospital, 3 months on a doctor-ordered liquid diet, and the first 4 months of 2013 using a walker. It was really hard on my husband and I, and to be honest, for a minute there we didn’t know if I was going to make it or not. My 2013 New Year’s resolutions may sound simple to most people, but for me it felt like a raging river I was unsure I would ever be able to cross. Make it through the rest of 2013 without a visit to the hospital. Be well enough to eat normal food. 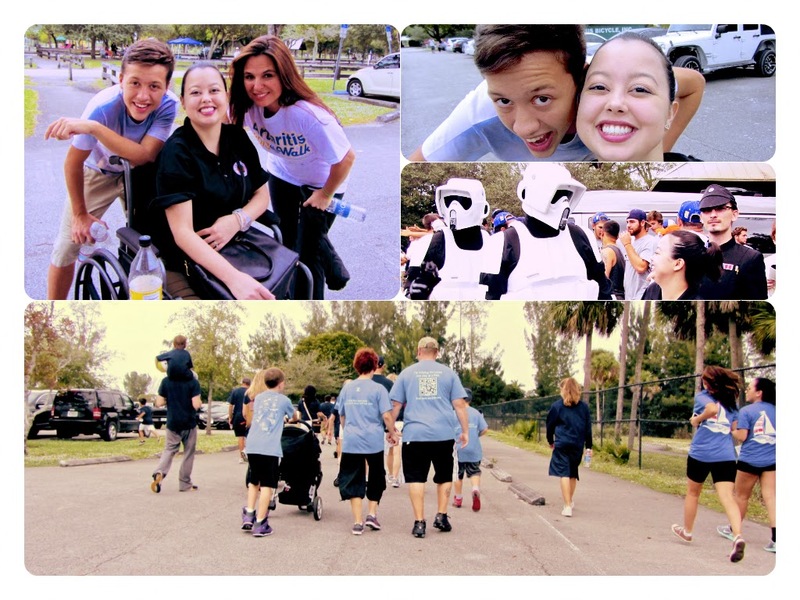 Make it to the annual Arthritis Walk in November. Reach out and re-analyze the company I keep. Start a blog, help others like me, and bring awareness to Arthritis. Although it was a very difficult time, I’m proud to say I achieved all my goals and then some! We did have some bumps along the road. We were forced to move out of our apartment because my health, had to give our dog away, and dealt with two failed treatments. It was very disappointing and disheartening, and I cried a lot. But I must say there were some great memories and amazing achievements that I am so proud of. For one, we moved back in with Andres’ parents which ended up being a great decision as we now have a much better support system. Second, we gave our dog away to the most perfect couple on Earth-whom I believe really needed and wanted her- which resulted in us making two great friends. And lastly, I was able to switch to two new treatments with the guidance of an amazing doctor. As if that wasn’t enough, I also got the incredible opportunity to start a blog, publish an article in Women magazine, and bring awareness to RA by doing interviews on WSVN and RadioMD! All in all, it was a difficult, but good year. And I can’t wait to see what’s in store for me in 2014. Stay off of Prednisone for one year. Loose 10 pounds by eating healthy and exercising when possible. Have at least one successful treatment this year. Be well enough to do the things I love and spend more time with the people I love. So tell me, what are your Resolutions for 2014? So on Saturday I went to my very first Arthritis Walk! I have been dying to go for years, but never could because I was either in the hospital or way too sick. 😦 Thanks to my dear friend Julie, my dad, and my brother Josh this year I was finally able to go and it was AWESOME!! At first I was kind of hesitant because I knew I wouldn’t be able to do the actual walking, but my Support System was there pushing me in my wheelchair for 1.6 miles! I’m so grateful, I’m sure they were getting a hefty workout…lol. We even got to raise money for Arthritis while we were walking using this app called ‘Zimmer.’ The three of us with iPhones downloaded the app and were able to raise $1 for each mile we walked/rode.